I'd probably like Hammer King's Manowar-style heavy metal a little better if I hadn't just listened to Visigoth's latest album, which is a far more masterful treatment of the subject. As it is, their debut album, Kingdom of the Hammer King, still has some enjoyable parts, though its limited subject matter hamstrings it more often than not. The titles of the tracks sound like they were mad-libbed by a computer without a big enough pool of words, to the point that a track titled I Am the King coexists with a later one titled I Am the Hammer King. They're putting us on, right? Sure doesn't sound like it; the vocals have a deadly serious overtone to them (despite their fairly high-pitched timbre, like a slightly grittier Hammerfall) that contrasts with the enthusiastic, fist-pumping fun of other true metal acts. But there are still some good tracks; I Am the Hammer King proves to be simultaneously heavy and melodic with some nice guitar galloping, and Aderlass; The Blood of Sacrifice's swinging rhythm is quite listenable. I also liked the lyrics of Figure in the Black, which departs from the usual sword-and-sorcery stylings to embark on an ode to James Bond. And really, most of the songs that get some speed injected into them, such as We Are the Hammer, have legs of their own even when the tune and sound is fairly generic. Where it starts dragging is when they take the epic route and slow everything down; plodding tracks like Chancellor of Glory don't have a whole lot of energy in them, and the riffing mostly just consists of palm-muted power chords. Visions of a Healed World is another of these; many of the ingredients are there, but the songwriting just isn't there. By Glory to the Hammer King, I think most listeners will have had their fill of both hammers and kings. 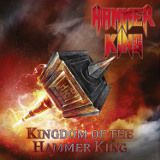 Kingdom of the Hammer King is a decent attempt, but its monotony contrasts so strongly with recent offerings that you'd have to really love the whole true metal genre to pick this example of it.